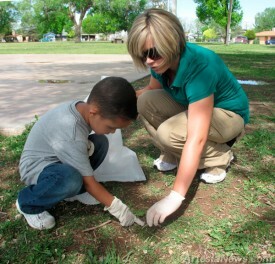 Headstart student Jeremiah Martinez and his teacher Ashley Langston pick up trash today at Guadalupe Park. Approximately 20 students from Headstart’s classroom five, along with teachers, parents and Linda Stevens of Artesia Clean and Beautiful, took part in the clean up. As a reward for their hard work, Stevens gave each child a hybrid cottonwood tree and a goody bag filled with pencils, environmental brochures and an environmentally-conscious activity book. “A lot of people litter … from now on, I hope you will remember this day and not be one of those people,” Stevens told the children.